PRESIDENT OF BASKETBALL operations with the Philadelphia 76ers, Bryan Colangelo, resigned this afternoon following revelations he used multiple fake Twitter accounts to praise his own work and criticise players, the team said. A statement from Sixers managing partner Josh Harris said Colangelo had tendered his resignation following an investigation into the allegations which emerged last week. “It has become clear Bryan’s relationship with our team and his ability to lead the 76ers moving forward has been compromised,” Harris said. Colangelo’s departure came after The Ringer reported that the executive had secretly operated five Twitter accounts under bogus identities and used them to take potshots at Sixers players and coaching staff. In a statement last week, Colangelo acknowledged using one anonymous Twitter account but denied any link to the four other accounts. 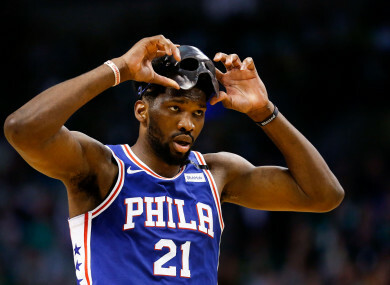 Colangelo took up his position with the Sixers in 2016, continuing a rebuilding process that helped them reach the playoffs this year for the first time since 2012. Email “76ers boss resigns after report he was behind numerous Twitter accounts criticising his players”. Feedback on “76ers boss resigns after report he was behind numerous Twitter accounts criticising his players”.